You can use the Import feature to create or update users on the Velpic platform. The importer allows you to upload a file in CSV format and match columns from your CSV file to Velpic user fields. The Import button is located in the top menu bar of the Users page. First, upload a CSV file containing the data of users you want to import. Mandatory fields are First Name, Last Name and Email Address.The importer skips any rows that do not have this information. Column headers in your CSV file are not mandatory. In Step 2, you can choose which CSV columns to match with user fields. Tick this option if the first row in your CSV file contains field names. This will ensure that the importer does not try to add the first row as a user. See Point 2.2 below for more information about user updating. Match each CSV column with a User Field of your choice. To match more fields, click on Match Another Column. Check the Sample Import Data to ensure you have matched the correct fields. To get additional information on import settings, see ‘More about Import Fields’ below. 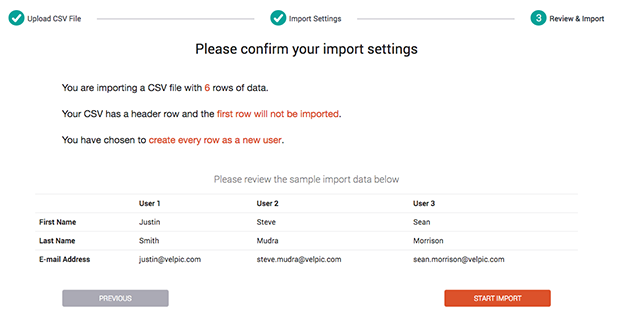 If you choose to Create New Users on import, the importer creates new users for every valid row in your CSV file. All new users created will receive an email with a username and password to log into Velpic. To get additional information on creating users, see ‘More about Import Fields’ below. You can select a field in your CSV file by which to update existing users. When that user is found, their existing data is updated with the new data from the CSV file. If that user cannot be found, a new user is created. If you update by, for example, email address, and there are multiple users in your CSV file with the same email address, a user already in Velpic with the same email address is updated with the data from the first row and the other rows are ignored. To get additional information on updating users, see See ‘More about Import Fields’ below. Once import settings are selected, you can review them and check Sample Import Data to see if fields have been matched correctly. If needed, you can go back to change your settings, and once you’re happy, click on [Start Import] to kick off the importing process. Once your import starts, the screen will display the progress of the import. If any rows in your CSV file are skipped because they could not be imported, you can download a separate CSV report with details of the skipped rows and related notes after the import is completed. You will also receive an email of the import status once it has completed running. The table below tells you which fields are changed when you choose to Create new users or Update existing ones. Basically, usernames and passwords are generated only for new users. If your CSV file contains data in those fields for an Update, they are ignored. Email Address (required) The email address of the user. Username - The username for the user.If not specified, Velpic creates a unique username based on the user's first name, last name and a combination of numbers. By default, a users user name is not replaced with data in a CSV on merge to prevent users credentials changing underneath them. To override usernames, tick the Replace option in the username row. Password - The user's password.If not defined for a Create import, the password is randomly generated and emailed to the user. By default, passwords are not replaced with data in a CSV on merge to prevent users credentials changing underneath them. To override passwords, tick the Replace option in the password row. Mobile Number - The mobile number for the user Yes Yes Phone Number The phone number for your user. Active Status - Set this field to determine if the user has access to the system. This can be used to inactivate or reactivate users. Active - Gives the user access to Velpic. Inactive - Blocks the user from logging into Velpic. The user’s current lesson schedules will be cancelled. Group - The name of the group you want the user to be a member of. To put a user into multiple groups, create a separate Group column for each one in your CSV file. Group Supervisor - The name of the group you want the user to be a supervisor of. To assign a user as a supervisor in multiple groups, create a separate Group Supervisor column for each one in your CSV file. By default, groups and groups supervised are completely replaced with data in the CSV when updating existing users. If you want to append the groups in the CSV, uncheck the replace option in the group row.